Parasites and microscopic viruses, left unchecked, can diminish the health and well-being of your poultry flock. Parasites and other viruses can easily be transferred from one bird to another. 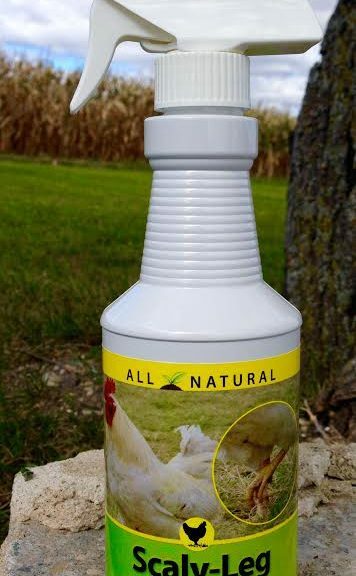 Use Scaly-Leg Defense to protect your chicken coop from the Scaly-Leg mite. Or, if already infested, eliminate the mite with our all-natural product. The Scaly-Leg Mite (Knemidocoptes mutans) spends its entire life cycle on birds and spreads mainly by direct contact. Scaly-Leg, is an infection that creates a scaly, crusty lesion and swelling of the tissue; affected areas may be the beak, face (scaly face), vent and legs. The skin appears as a thickened crust, protruding out, that can fall off. The scab itself is a layer of white dust.